As we prepare for our first networking event this Sunday, we thought we would share a few Networking tips for all those attending. The Date Palm is looking for a retail sales staff member to work part time hours starting mid September. Candidate must have a flexible schedule and be available for minimum two shifts per week. Wednesday shifts are mandatory plus one more day. We are looking for a retail sales person with an outgoing and upbeat personality. He/she is someone who our customers look forward to seeing in our store and tell their friends about the great experience they had at The Date Palm due to the excellent service provided by our staff. Candidate should be enthusiastic to learn about the products & people in our shop and can convey that enthusiasm to our customers. They should also be willing to go above and beyond the minimum requirements and be willing to stay late, work extra shifts and hustle to get tasks done in a timely manner. He/she should also be goal orientated and excited about working on a team to achieve a common goal. Candidate should have excellent communication skills both written and verbal and be very organized and task driven. Provide excellent customer service and meet the basic demands of the store, in the fitting room and at the cash register. Answer phones courteously and promptly. Ring up on the register, report and handle all required transactions, issue receipts and pack merchandise. Accept product deliveries and input into the pos system. General cleaning & store maintenance. Additional marketing, merchandising, online tasks as required. 6 months of experience in customer service, retail industry preferred. Please email your resume along with a letter stating why you would like to work at The Date Palm to hello@thedatepalm.com no later than September 1st, 2016. Ahhhh, Ramadan. What a wonderful time of the year, isn’t it? Although it is a very spiritual month for Muslims, it’s also atime of the year when people believe that they will lose weight from fasting (I know you’ve heard the aunties talk about it). What? You thought that too? Oh dear… it’s very easy to believe… I mean you don’t eat the entire day so why wouldn’t you? Well I’ve done all the research so you don’t have to! Here’s what I’ve learned from research and my own experience. Lots of fibre is the key to a healthy suhoor/sehri. SEHRI: When you wake up for Sehri, what do you normally eat? Parathas?Junk food?Maybe some leftover samosas? Although it sounds really appetizing, it’s not doing your body any good. What a shocker! You should try replacing this meal with wholesome foods that provide your body with short bursts of energy throughout the day; like oatmeal, whole grains, fibrous vegetables and protein. Your body takes longer to break down and absorb these foods so they will keep you full for longer. Tip: Never skip Sehri. This is the meal that is going to fuel you for an entire day so eat wisely. AFTERNOON/EVENING: After you have completed your daily tasks, take a nap! Yes you heard right. TAKE A NAP. We’re all experiencing shorter nights due to taraeweeh and waking up for Sehri. So let’s do the math. Shorter nights = sleep deprivation=LESS ENERGY. DO NOT work out while fasting. You have no way to hydrate your body and dehydration = RISK OF INJURY. Seriously, don’t try to be a hero. Don't be afraid to lace up those runners this Ramadan! Fitness is just as important now as it is during the rest of the year. IFTAR: Although these are the last words on the planet that you want to hear right now, I’m going to go right ahead and say them: Portion Control = DO NOT stuff that pot of biryani down your throat.Plan your meals ahead of time which saves you from eating whatever is available at the last minute. I’m not going to tell you that you should be eating grilled chicken breast with steamed vegetables and ½ a cup of brown rice every night because that’s not exactly ideal… I also know you’re going to be too tempted by your mom’s samosas (I know I am). So here it is, try to eat as healthy as you can. Take a meal that you like and try to replace the unhealthy parts of it with the healthier option. So go ahead, eat that samosas, and just bake it instead of deep frying it. Also, you want to eat slowly to let your metabolism activate. WORKING OUT: You should only be doing what you are comfortable with. You shouldn’t push yourself too hard (you won’t lose muscle or strength if you continue to eat healthy). Your goal should just be to maintain what you already have and when Ramadan is over you can jump right back into those intense workouts. During Ramadan, aim to workout 3-4 times a week instead of training 6-7 days a week. You should only workout AFTER you have broken your fast so have energy and can keep hydrating yourself throughout your workout (remember, dehydration = risk of injury!). Focus on strength training. That’s right ladies, pick up those weights. Strength training will prevent muscle loss. Check out the Stronglifts 5x5program, it’s what I’ll be sticking to during this month. It is really important to make sure you stay hydrated while you workout. Even if you choose not to workout, aim to drink 2 liters of water between Iftaar and Sehri to keep yourself hydrated. GOOD LUCK EVERYONE & RAMADAN MUBARAK. 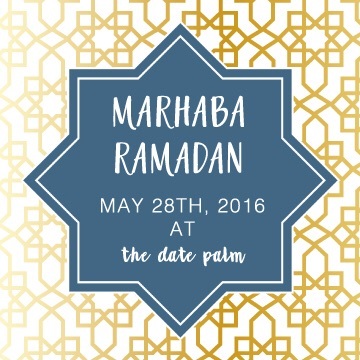 You are cordially invited to our Marhaba Ramadan event at The Date Palm on Saturday May 28th from 12-7pm InshaAllah! We have been looking forward to hosting this event since we opened the store. Here's what you can expect at our Ramadan kick-off event. a huge and fabulous gift basket raffle featuring beautiful items from The Date Palm. For every $10 spent on that day you will receive a ballot to win this fantastic prize! Lots of in store sales! Stay tuned to our Instagram (@thedatepalm) for updates on this! New products for Ramadan & Eid including decor, gifts, treats, outfits and more. The Date Palm will be launching a special charity project for our shop! 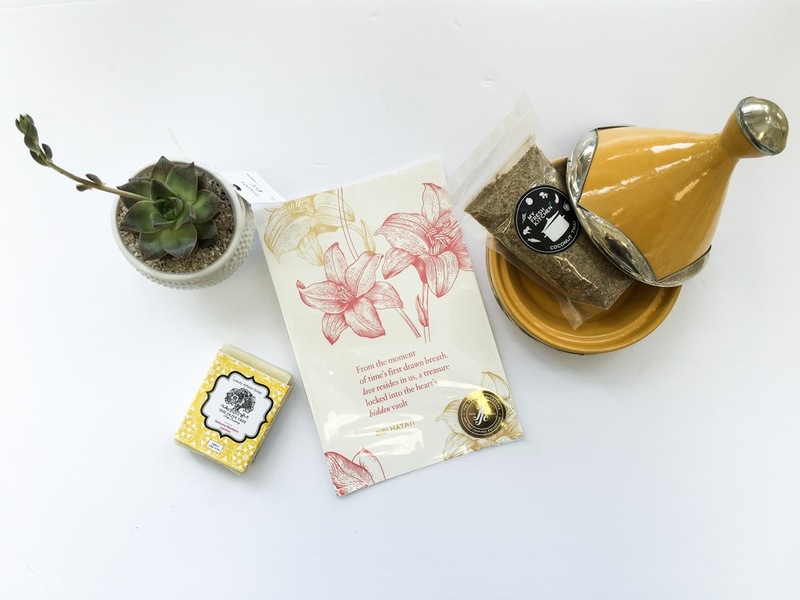 Complimentary chai and sampling of Blossom & Bean's new premium date line for Ramadan. We hope you can join us at The Date Palm. Address with map located here.